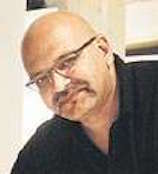 Atul Bhalla was born in 1964 in New Delhi. He received his degree in B.F.A. from College of Art, New Delhi. He received his degree in M.F.A. from School of Art, Illinois in USA. In 2000 he exhibited solo at Academy of Fine Arts and Literature, New Delhi. In 2005 he exhibited solo in New Delhi. In 2007 he exhibited in Noida and Mumbai. In 2008 he had a solo exhibition at Aicon Gallery, London. In 2009, 2011 and 2014 he had solo exhibitions in New Delhi. In 1989 and 1990 he participated in group shows in Illinois, USA. From 1991, 1996 he took part in the Annual Painting Exhibition at All India Fine Arts and Crafts Society (AIFACS) and the National Exhibition of Art at Lalit Kala Akademi, New Delhi. In 1997 he took part in a group show at Birla Academy of Art and Culture, Mumbai. In 1999, 2001, 2002, 2004, 2005, 2007 - 2014 he took part in numerous group exhibitions in New Delhi. From 2007 - 2011 he participated in group shows in London, Frankfurt, New Jersey, Spain, Shanghai, Paris and Canberra. In 2006 he participated in group exhibitions in Ahmedabad and Germany. In 2008, 2009 and 2010 he took part in group shows in Mumbai, New York, Italy, Kolkata; at Aicon Gallery, London and at Grosvenor Vadehra, London. In 2011 he took part in a group exhibition at Jehangir Art Gallery, Mumbai. In 2013 he participated in a group show at Lalit Kala Akademi, New Delhi. In 1988 - 1990 Atul was granted a Tuition Waiver and the Best Graduate Painting Award by Northern Illinois University (NIU), Illinois in USA. In 1991 he received an award from Sahitya Kala Parishad. In 1994 he received the Honorable Mention by Lalit Kala Akademi, New Delhi. In 2009 he was granted Art Residency at IAAB Ateliers, Basel in Switzerland. Atul lives and works in New Delhi.